Six soldiers were killed on Wednesday morning in a double suicide car bomb attack at a military intelligence headquarters and a nearby military checkpoint in the northern Sinai town of Rafah. Earlier reports by state news agency MENA and Egyptian state TV said eleven people were killed, but this was later denied by a military source. Ten solidiers and seven civilians were also wounded in the "treacherous blast targeting security forces," army spokesperson Ahmed Ali said. After the initial blast, which shattered the main gate of the military facility and ripped through parts of its railings, unknown assailants fired rocket-propelled grenades at the building, state TV said. 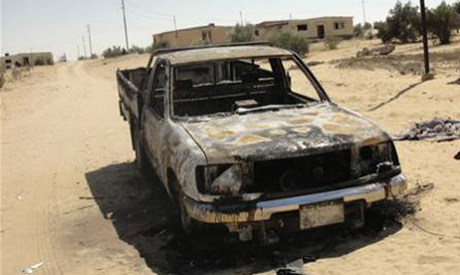 A second suicide car bomb hit a nearby army checkpoint minutes after the first attack. Egypt's border crossing with the Gaza Strip was shut in the immediate aftermath of the attack as the armed forces combed the area for suspects, MENA reported. The Rafah crossing is the only gateway into the impoverished Palestinian enclave which is blockaded by Israel. Egypt's military has launched a broad offensive against Islamist militants after an uptick in violence following the overthrow of Islamist president Mohamed Morsi on 3 July. The army has so far killed around 100 militants. The attacks come just days after an Al-Qaeda-inspired group in the peninsula claimed responsibility for a Cairo bombing that targeted the interior minister. Rafah adjoins Israel and the Gaza Strip. Another suicider went to hell...enjoy brother! MB supporters think this mess started as result of the popular coup. Morsi was president when 16 soldiers were killed in Sinai 2012. Why?? Because Morsi was coup leader too?? This shows ISLAMIST DON'T DESERVE FREEDOM! THIS IS WHAT HAPPENS WHEN YOU FREE JIHADISTS. Tourists are fleeing Egypt....Intellectuals are fleeing Egypt and investors are fleeing Egypt. All Saudi and Emirati money won't helpe Egypt if Egypt becomes a failed state....And Egypt is becoming a failed state. Whoever thought the military coup against democracy would pass without a price is now proven mistaken. Egypt has a stark choice between reverting to democracy or succumbing to terror and violence. The Islamists are simply too many to supress. Their grievances are too legitimate to dismiss.